As many of you know, a New Moon speaks of a time to plant seeds, a time to push into new adventures and forge ahead with things that we may have put on the backburner. Mercury will go direct (and end its retrograde cycle) on April 15, 2018 which it the same day that we experience the New Moon in Aries (9:59 p.m. EDT). Mercury retrograde cycle is a time to review plans and then once Mercury goes direct, we can push ahead with our ideas or plans. 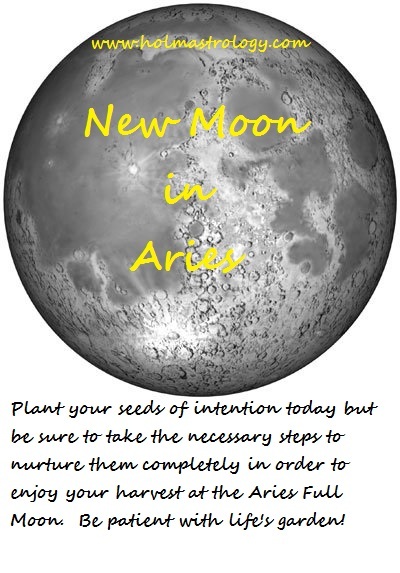 The combination of the New Moon and Mercury going retrograde is a perfect time to plant the seeds of our goals. I have read that some individuals connect the energies of this new April moon with truth and a need to forge ahead on some level. This could be due to the influence of Uranus’ conjunction to this New Moon. Transiting Uranus is at 28 degrees and the New Moon is at 26 degree and both are in the sign of Aries – the sign of energies geared to push ahead. The New Moon’s energy, as mentioned, speaks of a new cycle of energy pushing us to start anew with projects, with life objectives and personal plans. With this Moon phase being in the sign of Aries, this drive to push ahead is reinforced and we will be pushed even harder than normal. It may feel as though nothing can stop us if we decide to make that move. The “move” itself may be somewhat eccentric or unusual or it may point in a whole new direction because of the influence of Uranus. Both Uranus and the sign of Aries are geared for action, taking a new direction and pushing ahead because of the desire for change. It is important that you have been using the energies of Mercury retrograde and hopefully thinking deeply about what you are planning to do. Make sure that it is for the good of those concerned and that you are not acted rash and in an unprepared manner. Find a place within where you can review your objectives clearly and do not rush headlong into something that you feel unsure about or have not done you due diligence with. The energy will be powerful and the need to advance will be great, but the necessary planning should be in place before you move. Mistakes can happen under the “headfirst” influences of Aries and Uranus. Sometimes Uranus’ pushes for change and something new is exemplified with these energies and although in general Uranus does push for needed change, these changes can happen in rather unexpected manners. Find ways to germinate these seeds of adventure through planning and do not just simply jump ahead without forethought. Do not, however, hold yourself back simply because of a fear of failure. The energies of Aries make it quite easy to pick up the pieces and begin anew if necessary. It is a push and pull situation. If you are taking the necessary time to re-evaluate your options, move forward and plant those seeds. If you are certain about what it is that you want to do then push ahead full steam. In about 6 months’ time, you should reap the rewards of your efforts or if you did not nurture your seeds as you should have, it will be a time to do some weeding. Be sure to check to see which house Uranus and the New Moon are located in within your chart. This will provide you with information as to which area of life will be influenced by these energies. The house that your natal Uranus is located in and the aspects to Uranus in your chart will also provide some details as to what to expect and also how these energies might unfold.